Hurricane Rosa won't be a hurricane by the time it reaches the Southwest, but the storm will bring heavy rain to Arizona, Southern California and Nevada early next week. Rosa is weakening Saturday morning with maximum sustained winds of 100 mph. Additional weakening is expected over the weekend and Rosa will likely become a tropical storm by Sunday or Monday. The storm was located 625 miles south-southwest of Punta Eugenia, Mexico, and moving north at 9 mph as of 5 a.m. The storm will continue in this direction Saturday, before turning northeast on Monday. It is likely Rosa will make landfall in Baja California on Monday. Rosa is forecast to make landfall in Baja California and then move into the southwest U.S.
After making landfall, Rosa will continue to weaken as a true tropical cyclone. However, Rosa or its remnants will track into the southwest U.S. late Monday and Tuesday. The main threat from Rosa in the U.S. will be very heavy rainfall. 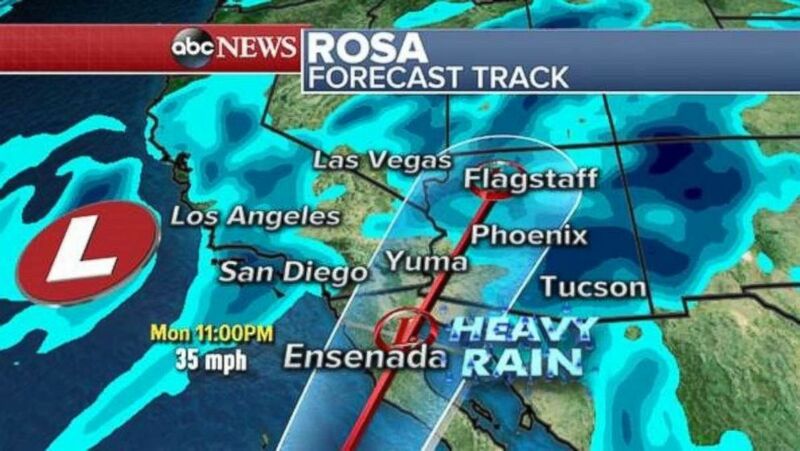 In the southwest U.S., abundant tropical moisture from Rosa will cause very heavy rainfall, with possibly total rainfall from 1 to 6 inches, locally. This rainfall could cause life-threatening flash flooding and dangerous debris flows. Landslides in mountainous terrain are also possible. 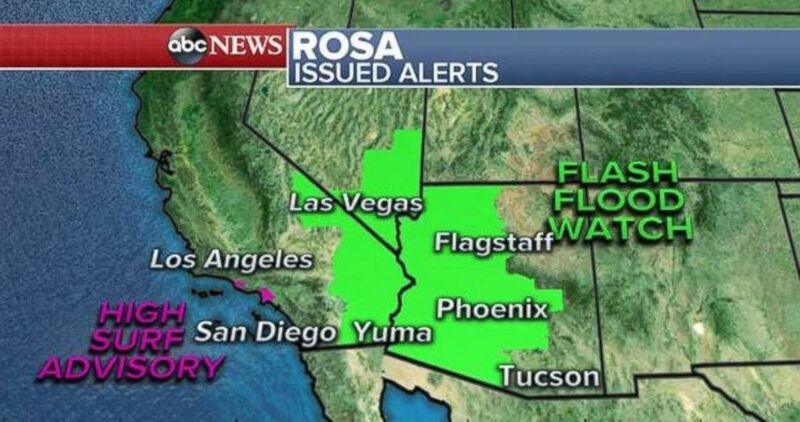 Flash flood watches are in effect for parts of Arizona, California and Nevada. A new flash flood watch has been posted that will go into effect for parts of Arizona, Nevada and California beginning on Monday. Large waves are possible off the coast of Southern California through Monday, with waves reaching as high as 10 feet on south-facing beaches. High surf advisories have been issued for parts of Southern California. A trough moving into California will help pull what's left of Rosa northward, where it will interact with the tropical moisture to bring a wide area of heavy rain to parts of the Southwest through the early days of next week. 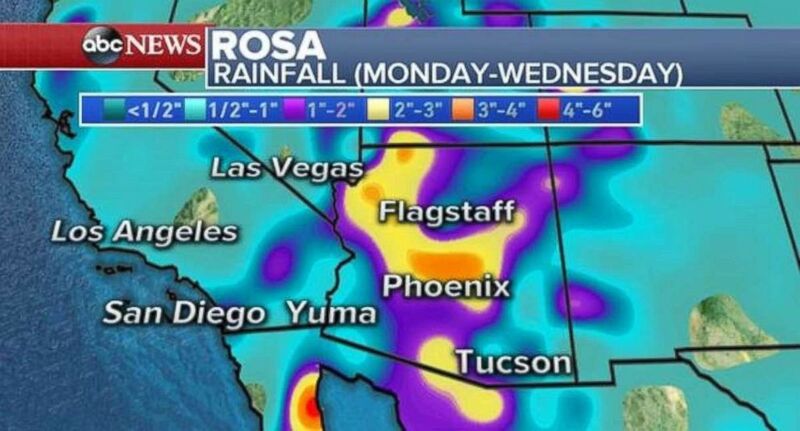 Rainfall could be heavy throughout Phoenix and Flagstaff, Arizona, early this week. Heavy tropical rain showers with isolated thunderstorms will develop in parts of the Southwest on Monday and Tuesday, especially in Arizona and southern Nevada. Rainfall rates of 1 to 3 inches per hour are likely, which could lead to possible “extensive flash flooding,” according to the National Weather Service. Rainfall totals of 2 to 4 inches locally are possible early next week, especially in parts of Arizona and southern Nevada, including Phoenix, Flagstaff and parts of the Las Vegas metro area. For this region of the country, this would be a significant rainfall event. Los Angeles and San Diego could see some of the first rain of the season, with up to a half-inch of rain possible locally. A quick hit of fall snow accumulated to over 6 inches in parts of eastern Wyoming and western South Dakota on Friday. A new disturbance will move toward parts of the Midwest late Saturday and Sunday and bring another shot of rain to parts of the region, especially across Iowa and northern Illinois. The rain could become locally heavy by Monday with possible rainfall totals over 1 inch. A dry weekend is ahead for the Northeast. 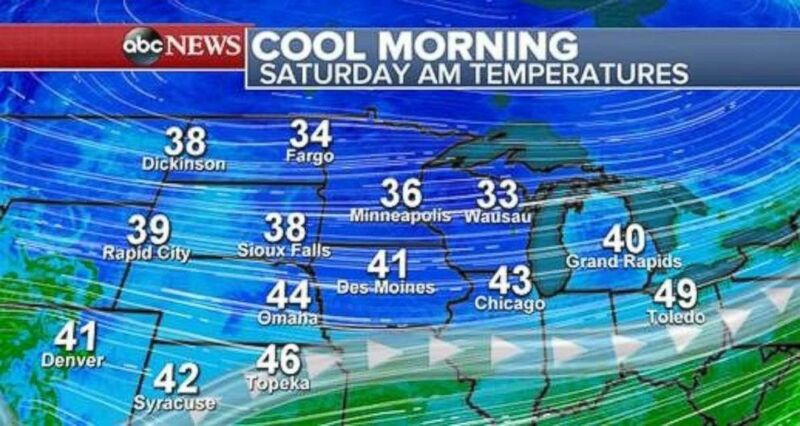 Temperatures are in the 30s and 40s across the northern U.S. on Saturday morning. Another round of cool autumn temperatures moved into parts of the Northern Plains on Saturday morning, with temperatures in the 30s in many spots across the Dakotas, Minnesota and Wisconsin. Some of the first frosts of the season are occurring in parts of the upper Midwest, including the suburbs of Des Moines, Iowa; Chicago; and Milwaukee, Wisconsin. However, it appears another dramatic swing in temperatures is likely for much of the country in the upcoming week. As a trough interacts with the remnants of Rosa in the southwest U.S., high pressure will slide off to the east and bring a notable warm-up to the central and eastern U.S. Temperatures could be in the upper 80s across the central Plains for parts of the week. In parts of the Midwest, there could be a nearly 20-degree rise in temperature by Wednesday. Some of this warm air makes it the Northeast with temperatures nearing 80 degrees heading into the first days of October. 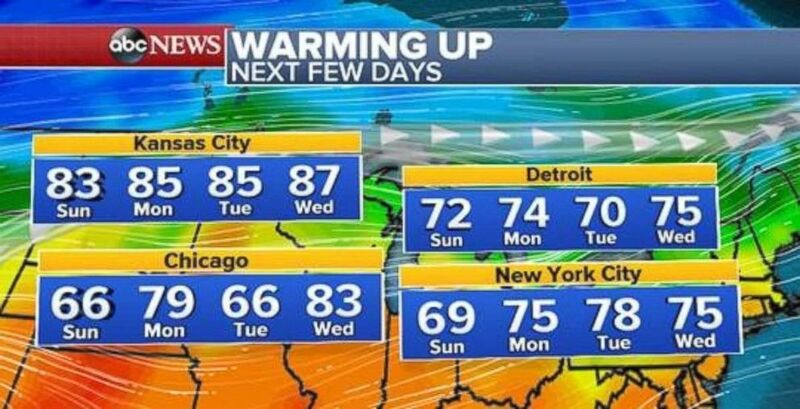 Temperatures will warm up in the Midwest and Northeast in the middle of the work week.